With interest rates decreasing and demand for houses increasing...we are still seeing a strong market here in Oakland and Macomb counties. It’s not uncommon for houses in the more affordable price bracket to have multiple bids on them, driving up the average sales price. However, in towns like Oakland township...residential sales prices have continued to climb, year over year. All of this work signifies longer days, warmer temperatures, and loads more sunshine...so, I will take it! If you have questions about vendors that we have used, concerning the above, or would like to make recommendations, I would love to hear from you! Buying or Selling a home is an important time and process in your life that you are bound to never forget. An exceptional real estate agent should have education, experience, people skills, hustle, availability, and the ability to negotiate solid deals. They should be a master of both organization and problem solving; casting vision and direction in one hand, providing reassurance and peace with the other. But…even if your agent had all of that and more…they would still be found wanting without the completion of a strong, seasoned team of professionals surrounding them. We are currently renovating our home, and no joke…I can spend 3 hours on Wayfair.com trying to find the perfect vanity lighting for our new bathrooms. WHY? Because that light will reflect (no pun intended) the kind of atmosphere and quality that aligns with the vision I have for my bathroom design. In the same way, when I make professional recommendations, it is because I KNOW that that person/company I recommend will provide my clients with the same standard of excellence and quality that I would require for myself. Creating a successful buying/selling experience for our clients is our top priority. Sharing our preferred mortgage lenders, title agents, inspectors, contractors, home warranty providers, etc…allows us to know that our clients are in the best hands in the business. Then, our confidence becomes yours. If you are thinking about buying, selling, or investing, we would love to help. Whether you are a first time buyer, or buying your forever home, the actual process of purchasing a home can feel daunting. There’s negotiating, inspections, an appraisal...and who pays for the title insurance again? There’s a hundred steps, and many times unforeseen hurdles that need to be overcome; all a part of the normal home buying process. It can be a staggeringly stressful time. But, we believe that whether you are buying your first home, or your last, the excitement of the new season and opportunity should definitely outweigh the stress. And, that is where we focus our time and energy. Of all of the things we love about this career, helping individuals and families reach their goals of home ownership is our favorite. We want to serve our clients by organizing and managing each step of the process, so they can spend their time focusing on what really matters to them. We work hard to make sure that our clients experience the most stress free transition into their next home, as possible. If you, or someone you know is wanting a refresher on the home buying process, we would love to be the ones everyone turns too. Consults and conversations are always free of charge...we’d love to help. Stoney Creek Orchard & Cider …located on 32 mile, we LOVE the simplicity of this You Pick farm, and the hay ride. Yates Cider Mill…it wouldn’t be Fall without visiting Yates for their famous cider, donuts, & apple pies! Visit the petting zoo, stroll along the river, and observe the apple pressing process. Miller’s Big Red… I hold this place near and dear to my heart since I take my youngest on a field trip here every year. Big Red’s does a beautiful job facilitating Rochester’s students with special needs. You Pick, petting zoo, cider mill, hay pyramid. Blake’s… We have taken our Floridian friends here, and had a BLAST! Check out both locations! You Pick, and LOTS of fall activities. Erwin’s… If you live closer to Farmington Hills, check out Erwin’s for a wonderful You Pick experience. Westview Orchards… Visit Westview for You Pick apples, pumpkins, and/or visit their winery. Paint Creek Cider Mill… We rode our bikes numerous times out to this cozy Cider Mill. Enjoy wonderful cider, donuts, milk shakes, and I have even been told that they have the best BBQ around. Goodison Cider Mill… Goodison Cider Mill is known for their fun Sunday outdoor activities for the kids, as well as their old-fashioned pressed cider. Rochester Cider Mill…a family and pet friendly environment with a petting farm and giant climbing hay pyramid. We hope that you create some wonderful memories with friends and family, enjoying some of the best experiences that Michigan has to offer! As always, if you or someone you know is thinking about buying or selling, please call us for a free consult! Stoney Creek...Canoeing, Kayaking, running, hiking, biking, golf, water slides, paddle boating, swimming, and one of my favorites...Paddle Boarding. My daughter and I rent the paddle boards once every summer. So. Much. Fun! Erma’s... The first time we went to Erma’s was on a Monday at 3pm...and the place was PACKED! You will not be disappointed. You must, you must, you must! Paint Creek Trail...Once a summer we would bike up to The Paint Creek Mill, get the kids ice cream...and bike home. The biking trails in Michigan are nearly endless. Check out Rails to Trails Conservancy. Sleeping Bear Dunes...this is more than a day trip...but it is worth every second. Hike the sand dunes, drive the scenic route, and take a ton of pictures. MOOmer’s Ice Cream, rated #1 on GMA a few years back, is also a must when you're out this way. Mackinac Island...I haven’t been yet, but everyone here says it is a MUST! Visit our gorgeous lakes! Whether the Great Lakes, or our crystal clear inland lakes such as Lake Ann, Higgins Lake, Burt Lake, Green Lake...these places are so amazingly beautiful! And, the surrounding towns are quaint and charming. Greenfield Village is a great place for family fun...you will feel like you just stepped back in time with early Americana baseball games, outdoor activities, and loads of educational fun. The Detroit Zoo...there are always activities and events happening here, in addition to the Zoo itself. Eastern Market Flower Day...May 20...Purchase your summer plants at a great price here...or just walk around, get a bite to eat, and take in all of the beauty . Up North...so, when we moved here we couldn't understand why everyone was always talking about going ‘Up North’ on the weekends. Newbies...here’s the deal...'Up North' has different meanings for different people, as stated in the linked article. For us it means anywhere about 30 miles north of where you currently are; usually a waterfront property. Stars are brighter, the pace is slower, and a bathing suit and sweatshirt is about all you will need. Up North you'll be sure catch your breath, roast some marshmallows, make amazing memories, and RELAX! TIGER’s Games...If you’re not a Tiger’s fan now, you might become one after going to a game! Heavner Canoe and Kayak...One of my FAV memories was kayaking from Milford to Kensington Metro Park one July 4th weekend. Cannot wait to get back out there. Music In the Park...live music every Thursday in Rochester, starting June 15th. Borden Park Festival of the Hills (Fireworks! )...Wednesday, June 27th this summer. This is definitely one of our family favorites! Romeo Peach Festival...check this out over Labor Day weekend...be sure to catch the parade. To be honest, some of my favorite summer activities are the simple things: dinner outside with friends, backyard fires, badminton, working in the yard, listening to the kids play flashlight freeze tag until 11 pm, the incredibly green grass, the glorious Michigan landscapes, and the gift of 18 hours of light. What are your favorite Michigan summer memories, activities and places? Many of you know that my family and I moved here from Florida a little over 5 years ago. We still learn new things about Michigan life and culture. For example, one of my best friends here suggested that our boys go outside and look for antlers...since now is the time of year when the deer shed them. Who knew? To my complete shock, my son came home a short time later with an actual deer antler, found not on etsy, but in our own backyard! Michigan Spring! As far as Real Estate goes, many of you know that we are still in a strong seller’s market. That means homes are selling in record time, many times above asking, if properly priced and marketed. If you are considering selling your home, we would love to help! However, I still believe that now is a perfect time to lean towards home buying! Let me share some facts from a class I attended taught by Dr. Ralph DeFranco, the Global Chief Economist for Mortgage Services and ARCH MI. Home values are forecasted to keep appreciating...which is favorable for homeowners...yet on the flip side, unfavorable for buyers who wait longer than they need too. Interest Rates Rising: a stronger economy and job market, as well as tax and policy changes in Washington all point to one thing: a rise in Interest Rates...the higher the rates, the less ‘home’ one can afford, and the more they will pay in interest over the life of their loan. Rent prices are rising higher than inflation! Put your money towards paying off your own mortgage and building your equity. Don’t Fear Another Bubble Bust: Our seller’s market is based on low inventory, a decrease in new construction, and an increase in demand for homes. According to the ARCH MI Risk Index, homes across the US are considered less than 4% overvalued. What this means is that there is not likely going to be a ‘bubble burst’ in home values like we all experienced 10-12 years ago. Quite the opposite. So, if you are wanting to buy a home now, or in the near future, I would love to invite you out to one of our Free Home Buying Workshops. I have teamed up with a mortgage lender, and a title agent, and we will unpack the financial and real estate side of the home buying process. This is a free service that we offer to our communities, so please share with anyone that you feel would benefit from our workshop! Email, Call or Text me to guarantee your spot. *Snacks and drinks to be provided. Enjoy your weekend, and I hope we all get some time in the sun! 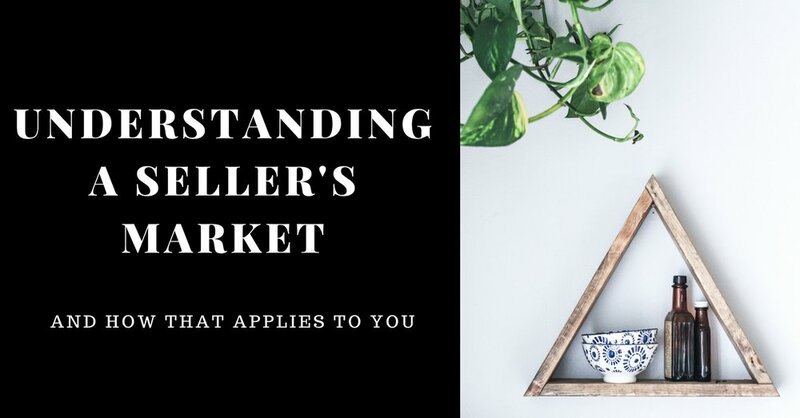 I am sure that you have heard the term 'Seller's Market' by now, but do you know how that applies to you? Let me share two stories from this week. Last Thursday, we gave the green light to a 2 bedroom condo we listed in Royal Oak. Within hours, there were 6 showings lined up, 2 offers came in on Saturday, and by Sunday evening, we were under contract for over asking. A few minutes ago, a friend that I referred to another Keller Williams realtor in northern Florida, told me that shortly after placing her home on the market, she had multiple offers flying in, with a Best & Final scheduled for this Thursday evening. All signs say that she will get over asking, as well. So, is it magic? Do you just put your house up for sale, and then BOOM?! 1. Are you properly pricing your home? This makes all of the difference. A good realtor will know what fair market value is, and how to price your home in such a way as to obtain the highest possible offer. 2. Is your home competitive in value? A good realtor will be able to help you prepare your home for listing day. They will know how to showcase your home's strongest features, as well as highlight your home's competitive value proposition. 3. Marketing, Marketing, Marketing... The time period after a home is first listed is critical for selling at top dollar. Make sure your realtor knows the whats and hows of effective marketing trends. The importance of a live MLS, such as our Realcomp, cannot be underestimated in today's market! 4. Someone to Manage the Process... With everything moving so fast, and multiple offers flying around, you have to make sure all of your i's are dotted, and your t's crossed. Hire someone who understands process, and who is committed to managing the sale all the way from the initial listing to the closing table. Now is a fantastic time to sell. If you, or anyone you know is considering selling their home, Tim and I would LOVE to help, and we always appreciate our clients, and their referrals.